We had our first frost over the weekend. I was startled to have to scrape my car. 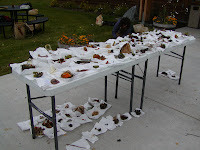 I took a class called Mushrooms of Kachemak Bay Fri., Sat. & Sun., and a frost is not the best thing for mushrooms, so when we did our field searches we stayed away from the higher elevations. Dr. Gary A. Larsen, a research professor with the Institute of Artic Biology from Fairbanks, was our instructor. He was very knowledgeable, and it was cute how he would oooh and aaaah about various mushrooms we had collected. Basically we met at a site and then he would send us off for an hour or two to scavenge and find as many mushrooms as possible. The table above is maybe 1/5 of all the mushrooms we found the first day. The second day we went out and found many more different 'srhooms since we were in swampy areas the second day, and higher lands the first. I brought bugspray with the expectation that walking cross-country through the woods would produce a swarm, but there were no bugs in the forest (thank goodness!). In the swampy areas we found crowberries, blueberries (shrivelled up) and lowbush cranberries. The cranberries we out-of-this-world delicious. My aunt had told me they are best after the first frost, and now I'll be able to eat them before, but will not pick lots of them until after the frost because they are sooooo good. 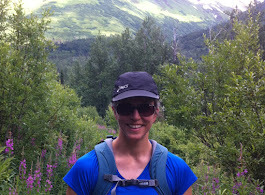 It was a fascinating weekend hanging out with dedicated mushroomers (there are morels in Alaska! They grow the first spring after a forest fire. ), learning what distinguishes different mushrooms and how to identify them, and some edible mushrooms. I am hoping Dr. Larsen makes the 11 hour drive down from Fairbanks again next year to teach this class again! Kachemak Bay Campus (KBC) in Homer is part of Kenai Peninsula College (KPC), which is part of the University of Alaska Anchorage system. It has taken me months to figure out this relationship. Kachemak Bay Campus has about 500 students enrolled each semester, which is roughly how many went through North Central Michigan College in Gaylord each semester. As in Michigan, there are dual enroll students (high school students taking college classes), as well as huge variety in the ages of other students. This semester I am teaching College Writing. Of my 12 students, 2 are dual enroll, 2 are older (over 30 or so) and the rest are in their late teens or early 20's. For nearly all of my students, this is their first college class. Based on student test scores, they are placed in Prpe086, Prpe108 or Eng111. Prpe courses are remedial to bring students up to college level skill. What I find most exciting about teaching here is the contact with other instructors. As an adjunct in the past it took me years to meet and get to know other adjuncts, and I never spoke with other instructors in my field. Here I am in regular contact with other instructors, most of them full-time. I will be collaborating with other instructors later in the semester with their students and mine involved in peer editing activities. I have met with other instructors about Service Learning ideas (of which I am a dedicated fan), and when I have questions about how to teach various skills I just drop one of the experienced instructors an email or catch them on campus. The down side of having colleagues is that it does take more time to network and discuss things. At this point I don't mind that and am just thrilled to be around other dedicated teachers who are good at what they do and passionate about helping students and trying new techniques in the classroom. I have already developed a reputation as being an "expert" in Blackboard, and have coached other instructors in its use. In fact, I will be developing the online delivery for Prpe086 this fall, and facilitating it (teaching it) next semester. When I received my Blackboard certification in Michigan last spring, my goal was to develop such classes. There is a great need for instructors who know how to use or are willing to learn alternative delivery methods. 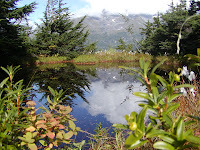 There are actually 2 campuses to Kachemak Bay Campus. I teach at West Campus, which is an old intermediate school. The faculty offices are there, and it is staffed by a secretary who sets up technology in classrooms as needed, makes photocopies for instructors (Wow! This is quite a benefit! ), proctors tests and handles whatever else comes up. East Campus is the nice and much newer campus. It houses the library, computer lab, art studio, campus bookstore and a very nice lounge area for students, as well as the administrative offices. It is expected that this campus will be expanded in a few years when the City Hall next door moves to a new location. West Campus will be closed and the City Hall will be renovated for the college. The benefits to having Kachemak Bay Campus part of the UAA system is that the resources are well beyond what a small community college would normally have access to. In addition, I can transfer more easily between the many campuses throughout the state since they are all part of the same system. 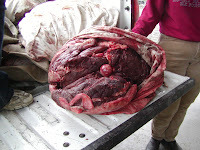 The pickup above is loaded down with moosemeat from 2 moose taken on a hunt in Denali this week. The people we are renting from and their families went to Denali for a week, in search of trophies. 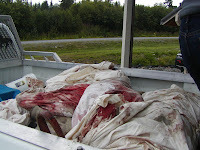 One moose they shot was a 13+ hour horseback ride back to base camp. It took 5 horses to pack all the meat, plus 3 horses for them to ride. Once they got one moose out that had to turn around and go back for the other one. They had cut out all the bones (besides the one you see in the middle of the hunk of meat above) and skinned them and left those for the coyotes, wolves and bears. It makes sense to cut out the bones because processing costs by the pound, and if the bones are there, it costs more to process. Our landlord gave us half a moose, which ended up being about 250 pounds dressed. We were at the processing plant when they brought the moose in yesterday and were able to choose how we wanted our cuts. The butcher was hilarious as he told us about different parts of the moose. He was describing how to cook each part and he would exclaim over the choicest pieces of meat as they were hung. It took over an hour with winches and pullies to get all the meat weighed and hung. 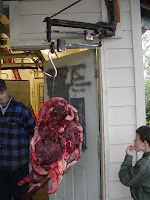 Some cuts were 150 pounds (haunch, shoulder). Moose is less gamey than venison, though of course more gamey than cow. Luckily we just bought a big freezer last week so we'll be ready! Processing is .60/pound, and takes about 2 weeks. The group also got a big grizzly. Residents of Alaska can get kill one grizzly per year in Denali because there are so many. However, it is illegal to sell grizzly pelts, and the meat is inedible, so there is a limit to how many you would want to get. Though they have lived here all their lives, they'd never gotten a grizzly pelt for themselves, onlyhelping others get theirs, so they were excited. Visiting Whittier is one of the cooler places we've been since moving to Alaska. 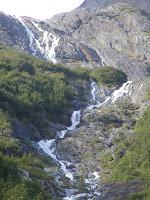 The falls you see above is, as far as I can tell, an unnamed falls that drops from the cliffs right to town and then into Prince William Sound. Whittier is considered the gateway to Prince William Sound, and as you can see by the picture of the town, boats are about all there is! The town is hemmed in by mountains and water, and besides a huge 10 story or so high-rise apartment building, there are very few houses/homes. It is a military town (or was; not sure how much it is anymore), so we discovered bunkers in various places. The hiking trail you see above led to the overlook above the town. It was 2-3 miles, and probably an elevation gain of 800-1000 feet. On our map, it looks like it might be the Horsetail Falls trail, but we never found any falls. The trail was quite a treat. It was boards most of the way, flat or made into steps. Where the boards slanted, there were old nets stapled to them for traction. Berry bushes lined the trail much of the way, so we got an introduction to salmonberries. They reminded us of a cross between thimbleberries and raspberries. They were on big, bushy plants with no prickers, but shaped like huge raspberries. Some were ripe, and others still green. At the top there were several pools of water like the one pictured here. I just wanted to stop and stay awhile it was so peaceful. The Billings Glacier pictured above was a glacier we saw from the top of this trail. They were doing some major blasting and roadbuilding in the area of the trailhead, so there was not enough room to park at another trail/creek a quarter of a mile down the road from this hike. We're saving that one for another visit! Three years ago when we visited the Portage Glacier, it was one of the highlights of the month we spent in Alaska. This time it had to have been the biggest disappointment of our trip, which is why I didn't even take a picture of it. 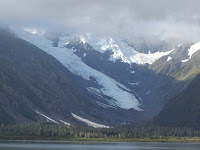 The glacier above is the Byron Glacier, which can be reached by a .8 mile easy hike. 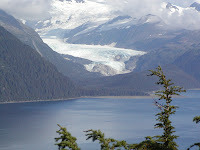 The Portage Glacier is well-known because it was a major supply route between Prince William Sound and Anchorage in the early days of the state. Portage Glacier is receding quickly, and when we visited 3 years ago we were able to walk on a paved path to within feet of the glacier. Now there is a lake where the road used to be, and you can pay to take a boatride on the lake to see the glacier up close. Since that wasn't the experience we or the kids wanted, we opted to go to Whittier, whose tunnel entrance is right by the glacier. That was a really cool experience! The tunnel is 2 1/2 miles long, one lane. Trains run through it as well, so the tracks are embedded in the road. The walls are rough-hewn stone. While the tunnel is narrow, it is also high to allow for the height of the trains going through. It was $12 round trip to drive through the tunnel, which we thought was a bit steep. 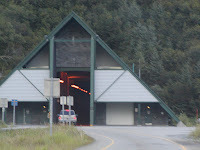 The tunnel is on half hour schedules, so for one half hour the traffic can go through one way; the next half hour vehicles can come through from Whittier. It runs from early morning to late night, and is closed throughout the nighttime. Besides boat, this is the only way to get to Whittier. It is the alternate route to the Portage Pass (the pass is basically going over the Portage Glacier). 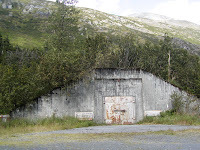 The tunnel and Whittier were built during the war, so Whittier is basically a military base. I'll cover more on Whittier in that blog entry! 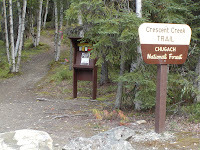 The Granite Creek Campground is a little over an hour south of Anchorage in the Chugach Mountains. There is not much special about this campground. While it is on a creek, it wasn't the sort you could do much with (too fast for wading, to muddy to fish, no nice spot to sit). There were no hiking trails or much of anything besides the campground. There were pit toilets and water, and the sites were very spread out so you didn't really feel like there were a lot of people there. 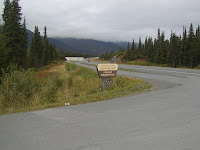 It is right on the Sterling Highway with paved bike paths stretching for many miles in both directions, and if we go back, we will bring bikes and/or rollerblades to take advantage of that. 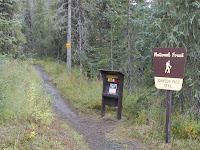 It is also just a mile down the road from the Johnson Pass Trail, a 23 mile long trail. We only made our way a few miles down it, as we found berries to pick. There were more trailing raspberries along here than anywhere else. I think trailing raspberries are one of the more delicious berries I've eaten. However, they are nestled close to the ground and you have to be looking for them. It takes many berries to amount to anything but a light snack, so we just enjoy the taste bud delight. 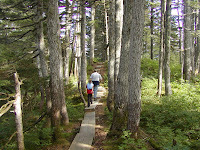 The Cresecent Creek area, about 1 1/2 to 2 hours south of Anchorage, is a fun outdoor playground area. There is a boat launch, 2 campgrounds (one more developed than the other), tons of fishing in the Crescent Creek, and hiking. 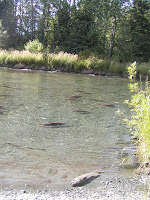 We stopped there on our way through and watched the fly fishermen pulling in the trout. As you can see in the picture, there were a lot of salmon. They are red because being in fresh water changes their color. Once they spawn they will die, which is why there is a dead fish in the foreground. 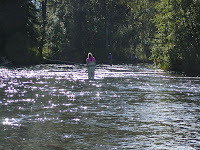 At this point the salmon are not good eating, but the fishermen were pulling in the trout from amongst the salmon. This was a beautiful Labor Day weekend so there were more fisherpeople out there than usual. The Crescent Creek Trail was a nicely kept up trail, wide so you could walk double, and through some nice woods. It is billed as a good trail for family dayhikes. The only downfall of this trail was that there were so many mountain bikers careening down it that we had to be on constant lookout for them. I think at least 25 bikers zoomed by us in the 1 1/2 hours we were on this trail. Again, Labor Day weekend may have made the traffic heavier than usual. We delighted in picking some berries. The crowberries a few miles up the trail were huges and juicy, which is unusual for crowberries!